The little fishing town of Moalboal is charming enough to be included on the backpacker trail when exploring Cebu. There are plenty of things to do in Moalboal, including the Moalboal sardine run as well as some good opportunities for snorkelling. Diving in Moalboal is very popular among enthusiasts. Getting from Cebu to Moalboal is very easy, yet despite its popularity, the village is not as stifling as other well-known backpacker hangouts such as El Nido, even if there are plenty of guesthouses and resorts in Moalboal. 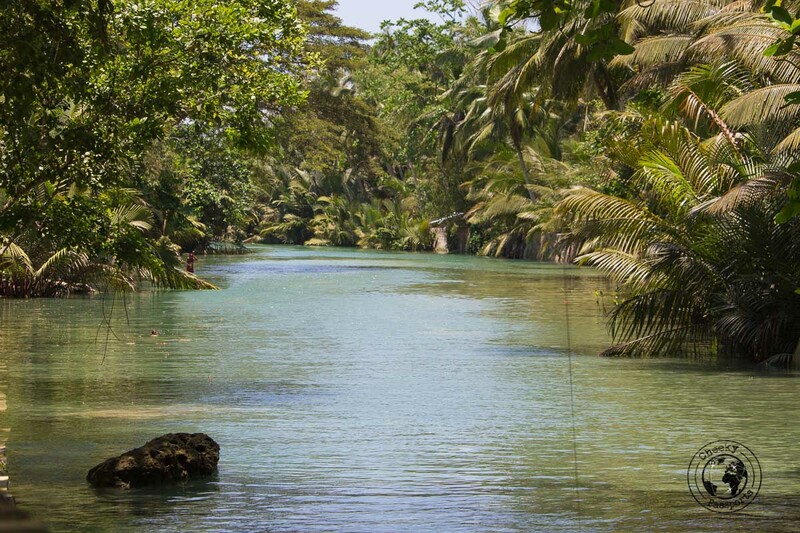 Additionally it is very easy to travel to and access Kawasan falls from Moalboal, making the village a perfect base for several activities. Having trouble booking internal flights in the Philippines? Choose Kiwi! The best way of getting from Cebu to Moalboal is by Ceres Liner from the South Terminal of Cebu City. Immediately upon entry to the terminal, you are obliged to pay a terminal entrance fee of 10 PHP (about € 0.15), after which you need to go into a building that looks pretty much like a canteen … and find the back door. Walk along a rundown path at the back of the building until you come to a door marked with the names of multiple destinations. This is the entrance to the waiting area for the bus from Cebu to Moalboal. Here you need to look or wait for a bus running to ‘Bato via Barili’ which will stop at Moalboal along the way. The bus journey from Cebu to Moalboal is about three hours long. The bus stop for Moalboal is immediately in front of McDonalds. From here take a trike to your destination in Moalboal (take a look at accommodation options and resorts in Moalboal in the relevent section of this blog post). A trike to Panagsama beach where a lot of the accommodation options and dive shops are located, should cost less than 100 PHP (about € 1.50) but many drivers initially expect a lot more, so try to negotiate. It’s always best to approach a trike driver yourself as some agents will be there to “help you out” for a commission. The Moalboal sardine run is perhaps the most famous of all things to do in Moalboal. 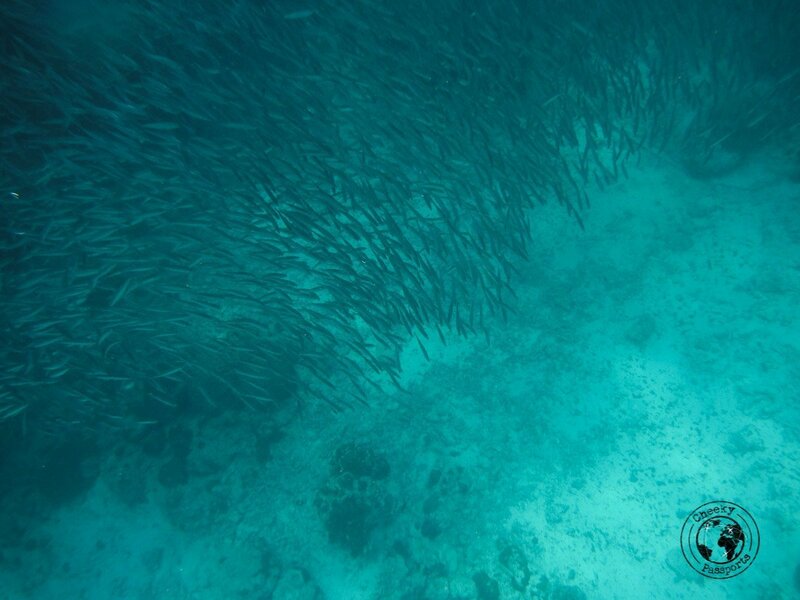 A school of over a million sardines is located just a few meters off Panagsama beach with easy access to practically anyone who wants to observe them. 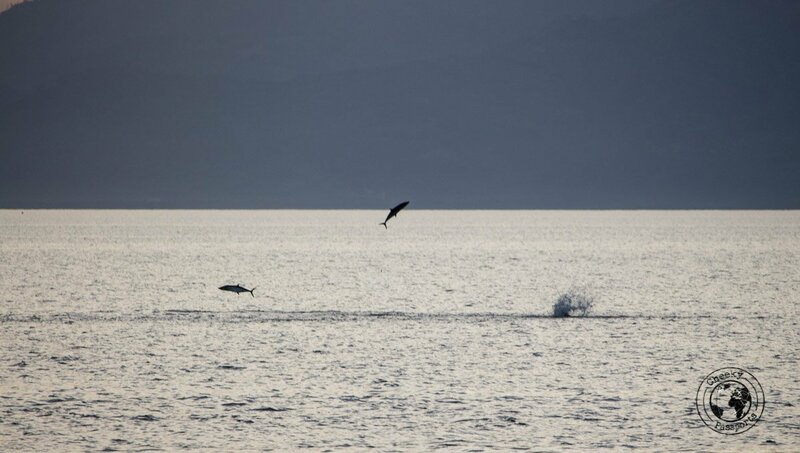 You don’t even need to dive to be able to experience the Moalboal sardine run, or even be a very good swimmer actually! Just hire a mask and snorkel (and floating jacket if you are not a good swimmer) and go to the little beach behind Quest Dive Center on the main road in Panagsama. Swim out for about ten meters until you reach the ridge and see a large dark mass – you can’t miss the Moalboal sardine run! The beach itself is not particularly beautiful, and we got lightly stung by some little jellyfish whilst we were snorkelling, so full body swimwear is recommended. The huge Moalboal sardine run is pretty impressive though! 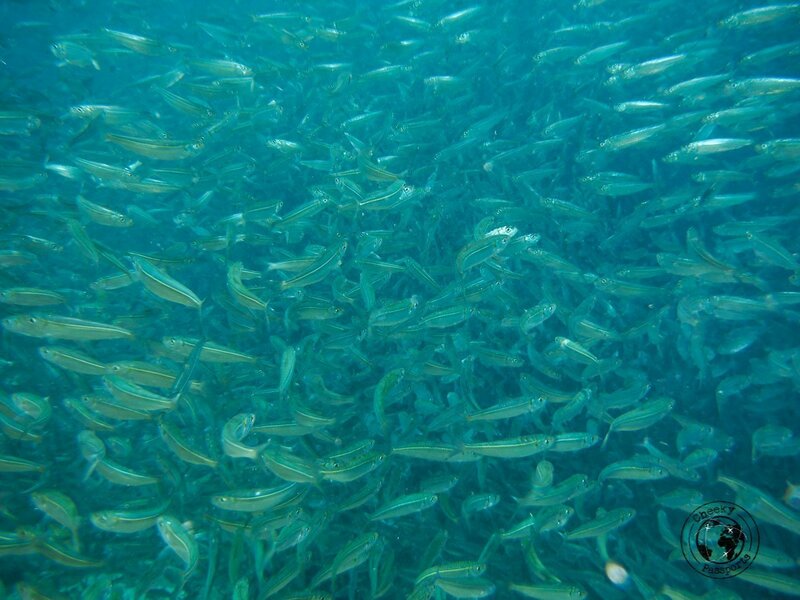 We really recommend that you invest in an underwater camera if you intend swimming with the Moalboal sardine run. Unfortunately we didn’t get the best shots with our old underwater camera (which has since been replaced by a GoPro), but you get the gist! 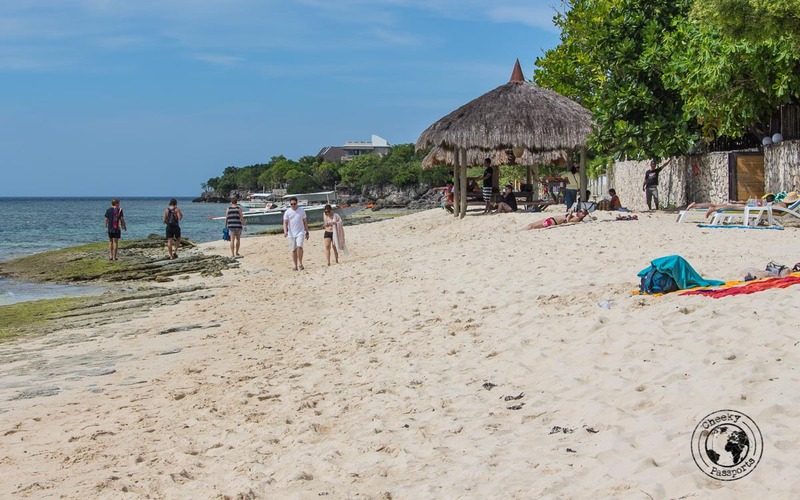 Although not the most beautiful beach in the Philippines, White Beach is a pleasant place from which to view the world whilst sipping on fresh coconut, when you’re exploring Cebu. You can hire a trike for 150 PHP (about € 2.50) to get here or better still, ride a motorbike. The trike stopped us at a resort entrance where we assumed we would be made to pay an expensive entrance fee. Instead, we followed the locals to another entrance a few meters away, where we paid only 10 PHP (about € 0.15) each. The part of the beach we initially came to was packed with locals in tents, cooking on BBQs; it was close to Easter weekend and apparently everyone was on holiday! The east side of the beach however was quite empty and proved to be a good spot from which to sunbathe, making it one of the most relaxing things to do in Moalboal. We chose to walk back to Panagsama beach because I felt that we needed some exercise (Filipino food is rather fatty)! We managed to walk back in about an hour with some photo stops along the way. 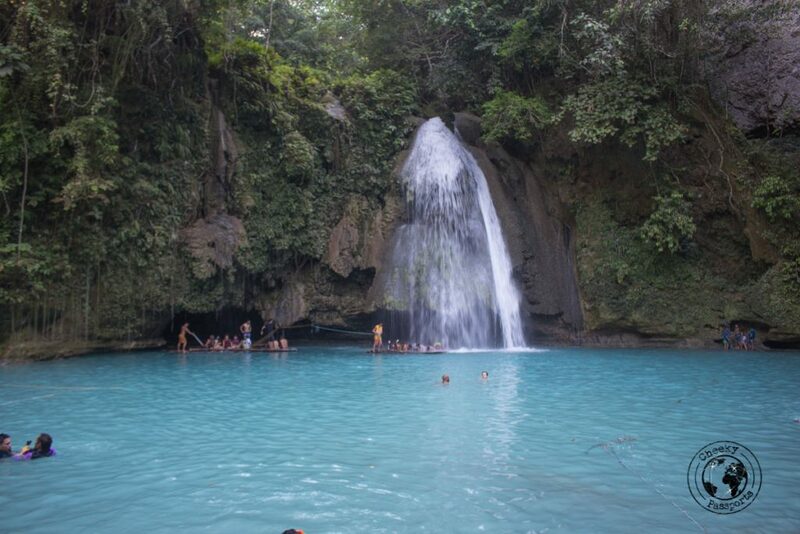 Moalboal offers a wide range of organised group tours to Kawasan Falls, one of the most popular destinations when exploring Cebu. Some of the tours included canyoneering which seemed like one of the most exciting things to do in Moalboal, but we didn’t afford this activity since we were traveling on a backpackers budget. Instead, we chose to go to Kawasan falls from Moalboal independently by motorbike which we rented for 300 PHP (about € 4.75) for the day. The falls, located about 20km away from Moalboal are very easy to drive to, but do try to be there early as they are extremely popular and tend to be very crowded especially during Easter week. The first tier of the falls, where the powerful river gushes down into a turquoise pool is probably the most beautiful of all three but is also the most popular. It is surrounded by tables and plastic chairs from two nearby restaurants. Do not sit or leave your belongings at table as you will be charged 300 PHP (about € 4.75) just for doing that. It is definitely worth the easy jungle trek to go up to the second and third tier where there are usually less people. Stands selling food are found at every level and there’s a rope swing and a natural slide at the third tier, the use of which, costs 10 PHP (about € 0.15) for a full day. It is very easy to get to Kawasan falls from Moalboal, so definitely include time for a day trip to the falls if you’re staying in the village. 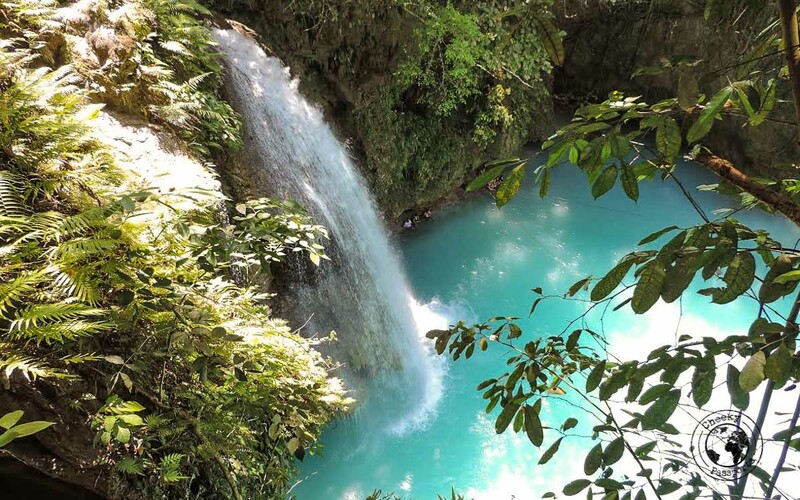 If you love chasing waterfalls, Cebu offers quite the selection! 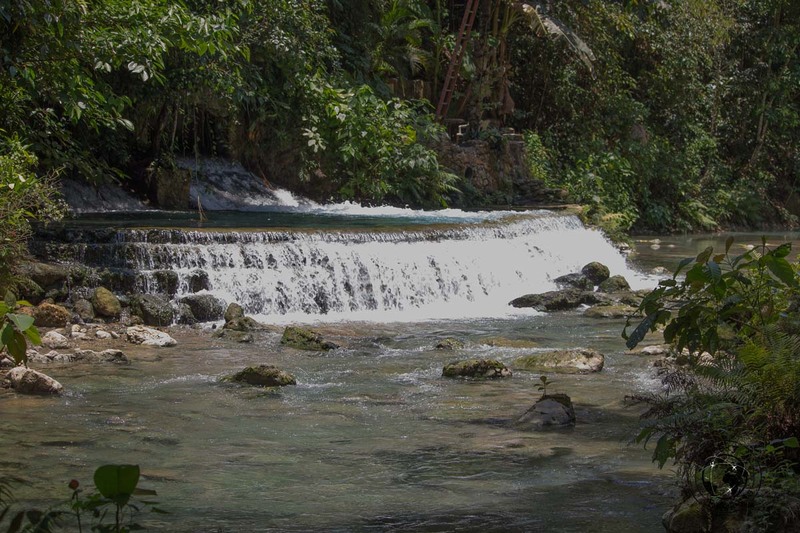 Read about the seven most fascinating waterfalls of Cebu in this post. We always promote independent travel, but if you need some help visiting the Kawasan Falls, check these Viator tours. 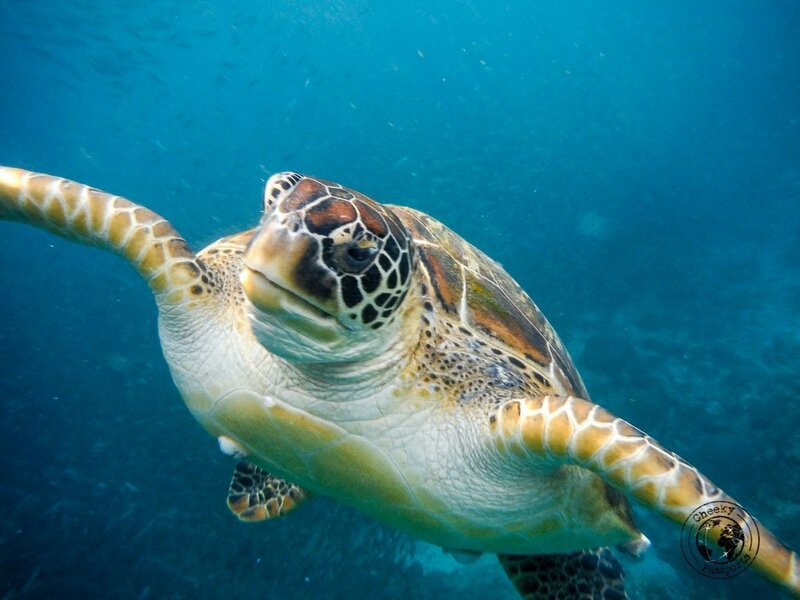 If you find yourself at the beach behind Quest Dive Center just before sunset, be sure to look out for the turtle that comes here to be fed by a kind local every day. The turtle was hit by a propeller and is partly blind and thus has difficulty looking for its own food. Yet it is incredibly friendly and seems to enjoy the company of whoever is close by during its dinner time! 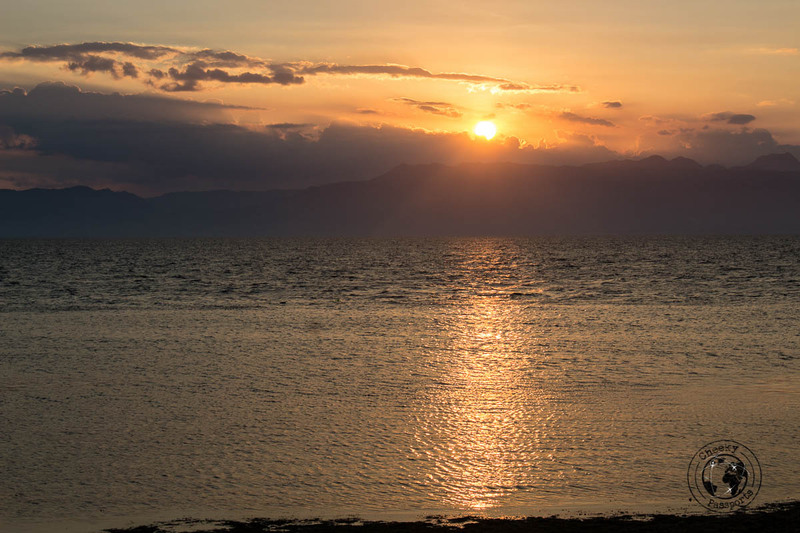 Although not exclusive to Moalboal, the sunsets here are just as stunning as those seen from other sunset spots in the Philippines, and should definitely make it on your list of things to do in Moalboal. Best place? Anywhere on the beachfront or even better from one of the beachfront resorts in Moalboal if you have the budget for it! Best viewed with a chilled San Miguel beer in hand of course! 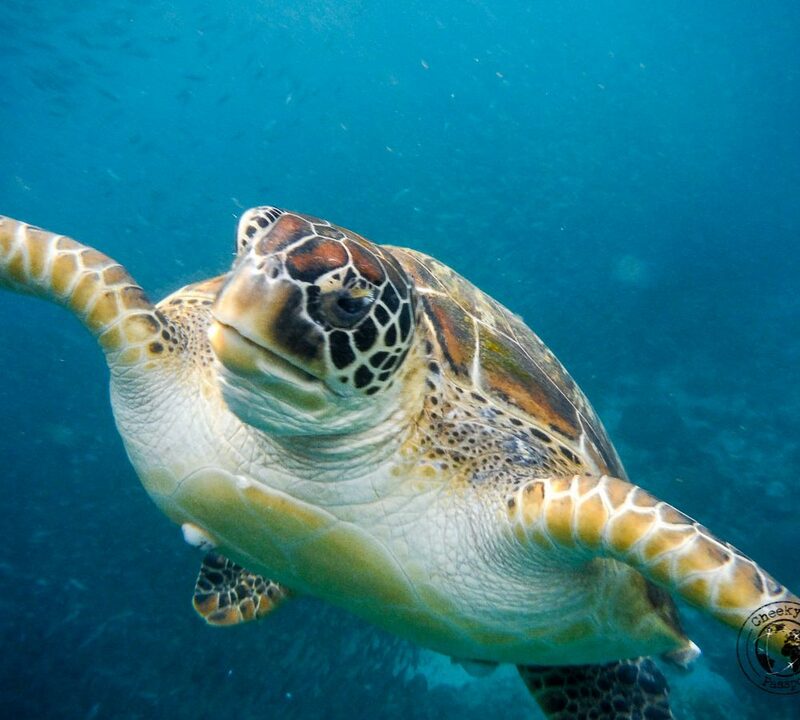 Diving in Moalboal is well known among enthusiasts for a wide range of sites and opportunities. Most of the dive sites can be reached within 20 minutes and several dive resorts in Moalboal offer multi-day packages for diving in Moalboal. Pescador island offers some of the best diving in Moalboal making it the main dive attraction. Here you can encounter lots of frog fish and other reef fish among the colourful coral. White tip reef sharks are rather common, and if you’re lucky you can see thresher sharks too! Several other exciting dive sites making diving in Moalboal one of the best things to do when exploring Cebu! Diving in Moalboal will set you about about 1,500 PHP (about € 24) per dive but several packages offering better rates are offered by many of the dive resorts in Moalboal. Many of the resorts in Moalboal are located in Panagsama beach, and are probably the most popular type of accommodation in the village. We stayed at The Blue Abyss Dive Resort, one of the more affordable resorts in Moalboal. A family room with fan set us back 1400 PHP (about € 22) per night, and included a great breakfast (we could choose any of the set breakfast meals on the menu). Other resorts in Moalboal can be booked here. For those traveling on a lower budget, a range of hostels and guesthouses can also be found around the village. Check the latest deals on Hostelworld, Booking.com or Agoda. We tried four different budget to mid-range restaurants during our stay in Moalboal with our favourites being Lantaw Restaurant (excellent Thai curry but no wine although this was included on the menu) and Ven’z Kitchen (do not ask for your food to be served very spicy as I did, they mean serious business here!). We would have liked to try the local eatery just a few metres up from Ven’z, but it is probably more of a lunch place as they seemed to run out of food by the evening. 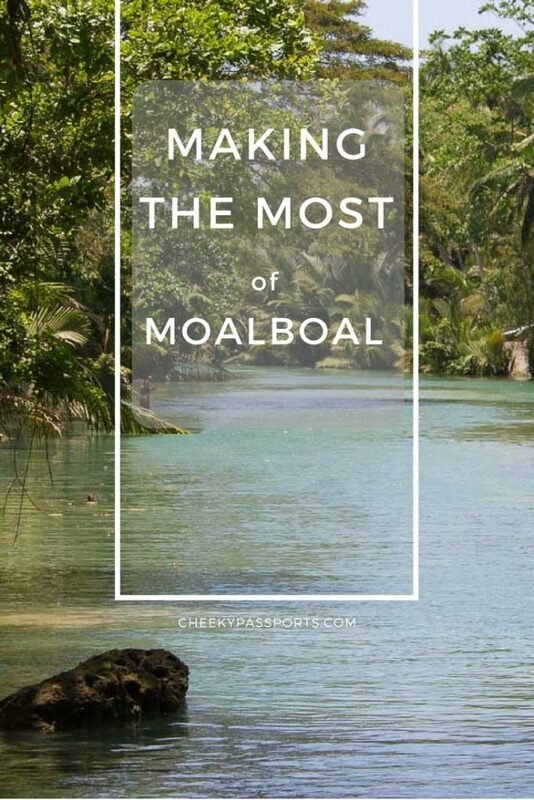 Many things to do in Moalboal, and easy access to Kawasan falls from Moalboal, make the village a great place from which to explore the surrounding area. Don’t miss out on Moalboal when exploring Cebu!